Note: Rice flour should be of fine variety. Usually we make this flour at home by washing rice grains, spreading it on cotton cloth & let it dry in shade (indoor) then mill it to fine powder (If dried in Sun it will not become perfect rice powder). In a mixing bowl add rice flour & salt, mix. Add hot water little by little mix well with spoon until dough comes together. When dough cools down a bit knead with hand to make soft dough. Note: Dough should not be too soft or too tight. Divide the dough into medium sized balls. Apply oil on plastic sheet. 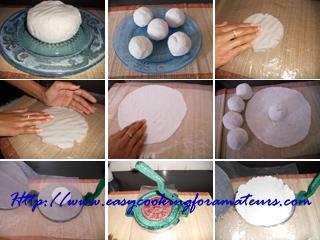 Place a ball of dough on the plastic sheet. Pat the dough to flat with fingers by pressing all the sides to spread evenly (as shown in figure). Wet the fingers with water to prevent dough from sticking. Note: You can also use tortilla press. 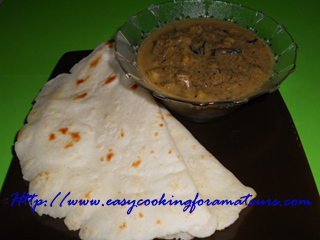 Gently transfer the roti from plastic sheet to your hand and then on to tava. Note: If the roti is not easily transferred to hand you can directly Inverse the plastic sheet on the tava to transfer the roti. Make sure plastic sheet does not stick to the tava during transfer. Sprinkle little water on top of roti. Cook both sides until it spots golden brown on sides & center. Roti will be soft when served hot. Rice Roti is usually served with Bitter Gourd Gravy, Pumpkin stir fry, brinjal gravy. Rice bread looks delicious. nice recipe. very soft n delicious looking roti! Thnk u for sharing this recipe.. looks delicious!! very authentic... i make it somewhat differently..n insteadof plastc sheet u could use aluminium foil.. this redces the risk of plastic meltig..well done! @ Kitchen Boffin thanks for the tips.Will try it. This is my favourite roti, looks very yummy.